^ Michael Binyon. Aids victim Rock Hudson dies in his sleep aged 59. The Times. 1985-10-03: 1. ^ Overview for Rock Hudson. Tcmdb.com. [2012-12-04]. （原始内容存档于2009年3月30日）. ^ 3.0 3.1 3.2 Berger, Joseph, "Rock Hudson, Screen Idol, Dies at 59", The New York Times, October 3, 1985. Retrieved February 12, 2011. ^ Yarbrough, Jeff. "Rock Hudson: On Camera and Off, The Tragic News That He Is the Most Famous Victim of An Infamous Disease, AIDS, Unveils the Hidden Life of a Longtime Hollywood Hero", People Magazine, Vol. 24, No. 7, August 12, 1985. Retrieved February 12, 2011. ^ Dennis Mclellan. Phyllis Gates: Her marriage to Hudson had fan magazines raving. Los Angeles Times. 2006-01-16 [2007-09-05]. ^ Robert Hofler. Outing Mrs. Rock Hudson: the obits after Phyllis Gates died in January omitted some important facts: Those who knew her say she was a lesbian who tried to blackmail her movie star husband. The Advocate. 2006-02-28 [2014-02-15]. ^ McLellan, Dennis. Phyllis Gates, 80; Former Talent Agency Secretary Was Briefly Married to Rock Hudson in '50s. latimes.com: 2. 2006-01-12 [2012-12-25]. ^ Martin, James A. Hudson's Day of Revelation. ew.com. 1997-07-11 [2012-12-25]. ^ Dunphy, Harry. Hospital: Hudson liver cancer report is false. The Evening Independent. 1985-07-24: 3–A [2012-12-25]. ^ AIDS diagnosis is confirmed. The Modesto Bee. 1985-07-26: A–3 [2012-12-25]. ^ Hudson flown to California for treatment at UCLA. The Milwaukee Journal. 1985-07-30: 1 [2012-12-25]. ^ Rock Hudson Continues Rest At Calif. Home. The News and Courier. 1985-09-09: 11–A [2012-12-25]. 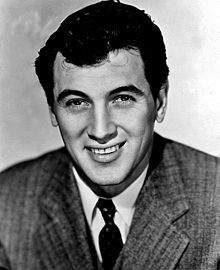 ^ Rock Hudson's death mourned. Eugene Register-Guard. 1985-10-03: 1 [2012-12-25]. ^ Final bravery of Rock Hudson moves actors. The Sydney Morning Herald. 1985-10-04: 10 [2012-12-25]. Clark, Tom; Kleiner, Richard. Rock Hudson, Friend of Mine. New York, NY: Pharos Books. 1990. ISBN 0-88687-562-5. Gates, Phyllis; Thomas, Bob. My Husband, Rock Hudson. Garden City, NY: Doubleday. 1987. ISBN 0-385-24071-6. Hudson, Rock; Davidson, Sara. Rock Hudson: His Story. New York: Morrow. 1986. ISBN 0-688-06472-8. Ragland, Shannon P. The Thin Thirty. Louisville, KY: Set Shot Press. 2007. ISBN 0-9791222-1-X.